Cells in the body divide and grow to replace damaged and old cells. Cell growth is highly regulated and when sufficient amount of cells are produced to replace the old ones, the division of normal cells is stopped. Regulation error in the cell division process can cause cells to continually divide in an uncontrollable manner, which leads to the development of tumor. Fallopian tubes are also known as oviducts, which are a pair of narrow tubes that transport ova (eggs) to the uterus. Abnormal growth of malignant cells in one or both fallopian tubes in women can cause fallopian tube cancer. Majority of fallopian tube cancer are of papillary serous adenocarcinomas type, the other two types of fallopian tube cancer are very rare such as sarcoma, which affects the muscular part of the fallopian tube and transitional cell found in the fallopian tube lining, and metastasis that spreads cancer cells to other parts of the body. The symptoms of ovarian cancer are similar to that of fallopian tube cancer, which include abdominal pain, watery discharge that may contain blood, vaginal bleeding, and swollen abdomen. Tests for diagnosis of fallopian tube cancer include CA125 blood test, pelvic exam, ultrasound, and CT scan. Some of the recommended treatment options for fallopian tube cancer are open surgery treatment, which involves the removal of the uterus through an incision in the abdomen and chemotherapy treatment, using drugs to kill cancer cells, which may be prescribed pre- and post-surgery. Increasing development of treatments is expected to boost growth of the fallopian tube cancer market. For instance, In 2018 Rucaparib, a poly ADP-ribose polymerase (PARP) inhibitor, developed by Clovis Oncology Inc. received FDA approval for the maintenance treatment of recurrent fallopian tube cancer, ovarian cancer or primary peritoneal cancer. Moreover, increasing prevalence of cancer-related diseases and genetic disorders are factors responsible for fallopian tube cancer market growth. According to 2018 statistics by the Foundation for Women’s Cancer, around 32,120 women are projected to die from gynecologic cancer diseases and 110,070 women are projected to be diagnosed with a gynecologic cancer in 2018. According to the American Society of Clinical Oncology, in the U.S., around 22,240 cases of ovarian cancer were diagnosed in 2017. Major challenges faced by the fallopian tube cancer market players include high treatment costs, and side effects associated with the chemotherapy treatment such as fatigue, hair loss, and nausea are expected to hinder the market growth. For instance, according to published article in Journal of the National Comprehensive Network 2016, the mean total payment per patient in the initial treatment period of ovarian cancer was US$ 65,908. 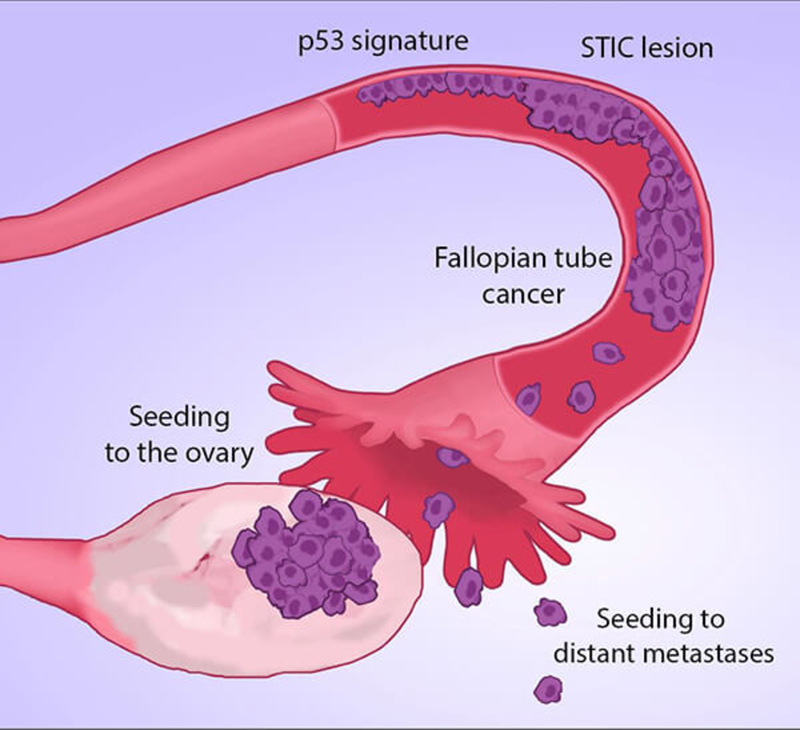 On the basis of geography, the global fallopian tube cancer market is segmented into North America, Latin America, Europe, Asia Pacific, Middle East, and Africa. North America fallopian tube cancer market holds a dominant position on account of increasing number of fallopian tube cancer cases and high R&D investment from government organization for the prevention of cancer-related diseases in the region. For instance, according to the National Cancer Institute in 2016 fiscal year report, around US$ 95,587,126 was funded for ovarian cancer research alone. Asia Pacific is considered as the emerging market in the global fallopian tube cancer market. Rising incidence of fallopian cancer in Asia Pacific is expected to be a major factor of growth for this region, supported by growing awareness among the population. For instance, according to a published article in 2015 Chinese Journal of Cancer Research, showed around 45,223 new ovary cancer cases, accounting for 3.11% of all new female cancer cases in China in 2011.